Sheila Fell, artist, born in 1931 grew up in Aspatria, a typical West Cumbrian mining village. She attended the Carlisle College of Art and within two years she had obtained a place at St. Martin’s School of Art, London. Here, she befriended Frank Auerbach, amongst other contemporaries, and went on to teach at the Chelsea School of Art. Sheila Fell held her first exhibition in 1955, courtesy of Beaux Arts, London. It was from this that she met L S Lowry, who purchased a number of paintings from this exhibition, and many more in the years that followed. This was to be a friendship that lasted until Lowry’s death in 1976. Indeed, he assisted her financially to the tune of £3 per week for two of her early London years. During her college years she exhibited her work in the Young Contemporaries Show in 1952 and 1953. In 1955 at the age of 24, she held her first exhibition, becoming the youngest ever artist to exhibit at the Beaux Arts Gallery in London. In 1957 she won the John Moore’s painting exhibition at the Walker Art Gallery, Liverpool. Acclaimed by critics, collectors and her peers, she began exhibiting at the Royal Academy in 1965, being elected an Associate Member of the Royal Academy in 1969, and a fully blown Member of the Royal Academy in 1974. Sheila Fell died in 1979, aged just 48. It is likely that she only painted some six to seven hundred paintings during her life, but what arguably makes them so powerful is her almost unique ability to convey the emotion inherent in a landscape; not just the landscape itself, but the impact it has on you. Most were of the Cumberland landscape. As Lowry suggested, Sheila Fell was arguably the greatest landscape painter of her age. Many of Sheila’s paintings are held in major public and private collections throughout the UK, including the Tate Gallery, Walker Art Gallery and in the Government Art Collection. 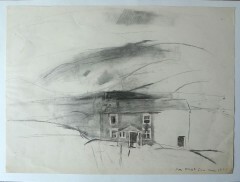 A Cumbrian Farmhouse. Drawing by Sheila Fell.